THE FIRST STEP TO GET DOG AND CAT PEE SMELL OUT! Applying Planet Urine’s UrineRelease Pre-Spray loosens stubborn, old dry stains and increases the efficiency of Planet Urine’s UrineOut Powder™ Cleaner. Learn more about Planet Urine’s UrineOut Powder™. UrineRelease Pre-Spray is the first step in cleaning dog urine, cat urine or human urine out of your carpets, couches, and even hardwood, tile, grout & concrete! Applying Planet Urine’s UrineRelease Pre-Spray loosens stubborn, old dry dog urine, cat urine, or human urine stains and increases the efficiency of Planet Urine’s UrineOut Powder™ Cleaner. Learn more about Planet Urine’s UrineOut Powder™. 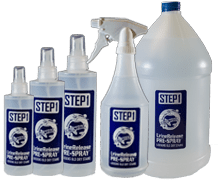 UrineRelease Pre-Spray is the first step in cleaning dog pee or cat urine out of your carpets, rugs, hardwood floors, upholstery, furniture, drapery and even concrete!